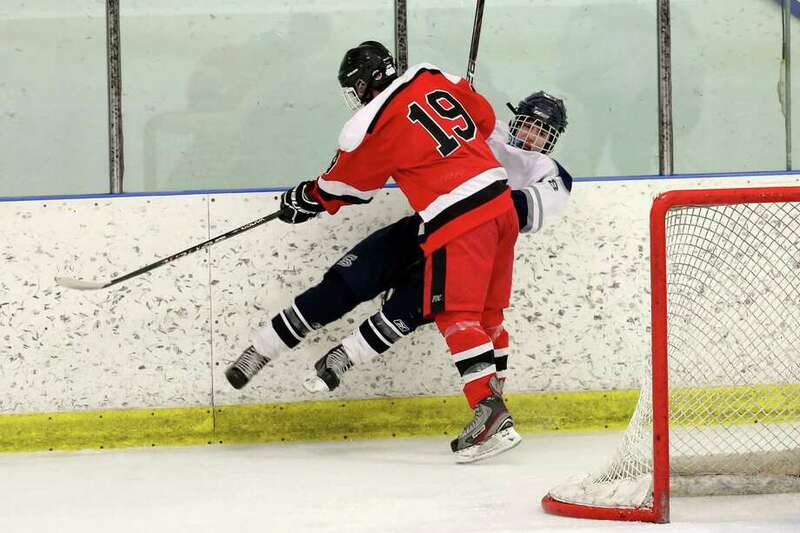 Fairfield's #19 Kevin Boldrighini checks Staples/Weston/Shelton's #18 Evan Mancini into the boards during Wednesday evening match up at Milford Ice Pavilion. The Fairfield and Staples/Weston/Shelton co-op boys hockey teams entered play Wednesday separated by just one point in the FCIAC standings with less than a handful of games left in the regular season. There was little room to separate the two teams on the ice when they met at the Milford Ice pavilion and overtime was required to break a 4-4 deadlock. Matt Roberts scored the game-winning goal 56 seconds into overtime as Fairfield edged Staples/Weston/Shelton 5-4 in a battle between two FCIAC playoff hopefuls. Fairfield improved to 6-8-0 (6-3-0 FCIAC) while the Wreckers dropped to 7-8-1 (4-5-1). "Right now we are battling for positioning at the end of our season, and hopefully getting in both tournaments," Fairfield coach Mark Pettorini said, referring to the FCIAC and Division II. "It's a very big win." Less than a minute into the extra session, Owen Emmendorfer took a shot from the circle that was saved by Staples goalie Will Englehart (23 saves), but Roberts crashed the net and knocked home the rebound. "It was a great blue-collar goal," Pettorini said. "We got the puck to the net, Roberts went hard to the net, the puck was there and he buried it. That's a text book play: just get to the net hard." The Fairfield defense stifled Staples -- which was without injured defenseman Ian Offenberg and suspended head coach Todd Sharinn -- for most of the first two periods. The visitors allowed few quality chances at the net in holding a 2-1 lead after 30 minutes. The Wreckers scored three times in the final period to extend the game. "No one wanted that game," Wreckers assistant Clay Harvey said. "There were a lot of loose pucks that no one wanted; it was anyone's game the whole night. It's too bad we didn't' start playing until the third period, when we did we were effective, it was just too late." Fairfield could have won the game in regulation after Jack McCormick broke a 3-3 tie with 3:59 left in the third period to give the visitors their fourth lead of the game. Soon after, the Wreckers were given a power play and pulled Englehart for a 6-on-4 advantage. Jack Mendillo fired a shot from the point that was tipped into the net by Jesse Greenspun with 1:13 left. Mendillo scored two goals for Staples, including one on a rocket shot 10 seconds into the third period to tie the game at two. Junior Trevor Demilt scored twice for Fairfield. "(Demilt's) a good goal scorer," Pettorini said of his first-year starter. "He's just consistent; he's not the flashiest player, he just works hard and scores; he's a blue-collar player." Although the Wreckers remain a threat to make a run in the Division III tournament next month, the loss severely damaged their FCIAC playoff hopes. "Every loss hurts, but as long as we can get our team to continue to grow towards the playoffs, that's all we can ask," Harvey said. "We are a shorthanded team right now." Fairfield goalie Mike Grace made 19 saves in his third start of the season. Records: Fairfield 6-8, 6-3 FCIAC; Staples/Weston/Shelton 7-8-1, 4-5-1. Goals: F--Trevor Demilt 2, Jack McCormick, Zach Weinstein, Matt Roberts; S--Jack Mendillo 2, Derek Nussbaum, Jesse Greenspun. Assists: F--Jack O'Rourke, Austin Armas, Owen Emmoendorfer 2, Roberts, Jeremy Zeigler; S--Nussbaum, Ryan Johnson 2, Eric Zurmuehle, Owen Engledrum, RJ Gupta, Mendillo. Goalies: F--Mike Grace (19 saves); S--Will Englehart (23).